It’s the standard adage here. Oklahomans are the nicest people. Well, that is, until it comes to executing people. When you look at it with that frame of reference, as people living in a particular legal jurisdiction in this country, we and especially our great leaders, Republicans and Democrats alike, are simply bloodthirsty barbarians waiting expectantly for their next victim. Oklahoma likes to kill its criminals. We lead the nation in the per capita number of criminal executions. Since 1976, the state has killed 112 people. Oklahoma was even the first state to implement lethal injection to make everyone feel better about killing people. We also imprison the largest number of women in the nation on a per capita basis as well. We’re widely known for killing people and imprisoning women. Howdy, y’all. People are so friendly in Oklahoma. Richard Glossip is scheduled to be killed by Oklahoma on September 16. He was convicted of murder in the 1997 beating death of Barry Van Treese, who was his boss and an owner of an Oklahoma City motel. Here’s the information everyone needs to be focused on: Glossip didn’t actually kill his boss, and he claims he is innocent. He was convicted on what prominent people and lawyers say is extremely slim evidence. He was accused of asking Justin Sneed to kill Van Treese. Sneed, in fact, admitted he beat Van Treese to death and was given life in prison in the case, but he claimed Glossip asked him to do the killing. Van Treese’s wife testified at the trial that she and her husband had found $6,000 missing from the hotel’s financial accounts and planned to approach Glossip about the issue before her husband was killed. But as actor Susan Sarandon has pointed out recently, there is no actual physical evidence that Glossip asked Sneed to kill Van Treese. Where’s the tape recording? Where are the corroborating witnesses? Sarandon, who starred in the film Dead Man Walking, has publicly asked Gov. Mary Fallin to grant Glossip a 60-day reprieve so his attorneys can gather and present more evidence on his behalf. Anti-death penalty activist Sister Helen Prejean, who was depicted in the movie by Sarandon, has also asked Fallin to intervene. Fallin has declined. 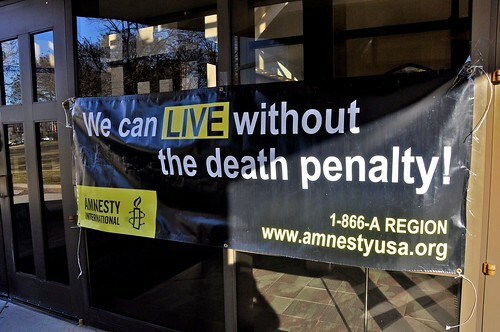 (1) The death penalty is barbaric and has been increasingly banned or not practiced here in the United States and throughout the world. Nebraska of all places just this year joined a growing number of states that have abolished the death penalty. Oklahomans should be ashamed we live in a place that leads the nation in this type of cruelty. (2) Glossip didn’t kill anyone. Even if you’re in favor of the death penalty, this should be a no-brainer. He didn’t kill anyone. Even if he did coordinate the killing, which is a disputed fact not supported by physical evidence, he didn’t do the actual killing. The actual confessed murderer, who could have simply informed authorities about Glossip and not beat someone to death, will be allowed to live. Why not simply give Glossip life in prison without a chance for parole? Why even take the minutest chance of killing an innocent person? The victim’s family and friends absolutely deserve our sympathies and justice, but life in prison is a major sentence. That’s what the killer received in this case. Even James Eagan Holmes, who killed 12 people and injured 70 people in 2012 at an Aurora, Colorado movie theater, received life in prison.